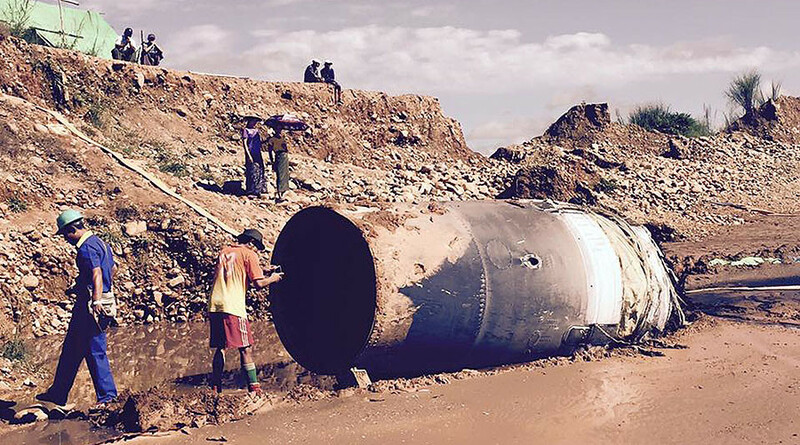 A large cylindrical object, believed to be part of a Chinese space rocket, fell from the sky and landed on a jade mine in the state of Kachin, Myanmar. The object reportedly bounced 50m in the air before coming to a rest. “Every local thought it was the explosion of heavy artillery,” villager Ko Maung Myo told the Myanmar Times. The object, measuring 3.7m by 1.2m, reportedly made a sound similar to a large explosion when it hit the ground, sending locals into a panic. It landed near two tents housing sleeping miners but no injuries were reported. “Initially, we thought it was a battle. The explosion made our houses shake. We saw the smoke from our village.” villager Daw Ma Kyi told the Times. — FreeKachin (@FreeKachin) 10 ноября 2016 г. A second piece of debris with Chinese writing on it fell through the roof of a nearby house, prompting speculation that the object’s origins lie in China. “I think it was an engine because I found a diode and many copper wires at the tail of the body,” Myo said. The Long March 11, a Chinese rocket, was launched from Jiuquan Satellite Launch Center earlier this week. Parts of the rocket were jettisoned during its launch. A former executive engineer of the Department of Civil Aviation examined images of the object found in Kachin and concluded it could be a rocket booster from a space mission.